This is diabanjo and I am back with inspirational news from an experience I was blessed with in July. 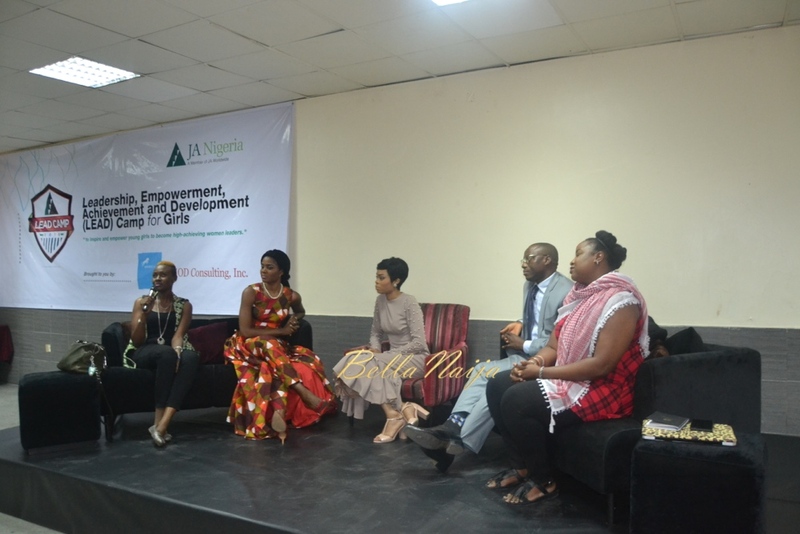 On behalf of the BellaNaija team, I was invited to join a panel by at LEAD Camp organized by JAN.
LEAD Camp for Girls (Leadership, Empowerment, Achievement and Development) caters to the Social Development Goals of a female child is a yearly program organized by Junior Achievement Nigeria (JAN), a non-profit organization that is part of the Junior Achievement Worldwide (JAWW) established in 1919 designed to educate and empower young boys and girls with the hope of transforming their future. “I developed LEAD Camp back in 2001 because after two years of running JAN, I noticed that some of the girls who were shy or timid at the beginning of the Company Program, were more confident by the end and needed just a little more encouragement to secure their new found leadership skills”. I was accompanied by Adesewa Josh (Channels TV), Adenike Oyetunde (Nigeria Info 99.3FM), Joel Nwokeoma (PUNCH Newspaper) and Priscilla Nzimiro-Nwanah (EbonyLife TV). The aim of this panel was to inspire the girls with our individual career journeys and also allow them to understand the role of modern media in our society today. With this information they were grouped in order to create a message for the achievement aspect of their program and deliver it on our individual media platforms. Here are the 7 girls I had the pleasure of working with in Group C, and their profiles and views below. What makes you unique? I speak well. Memorable Quote: “Always be yourself”. What have you learned from the LEAD Camp experience? “Be the best of who you are”. Message: “Power for Girls! Girls are discriminated against both in schools and churches. In most schools boys are given preferential treatment. When a girl decides to ask a question, not matter how intelligent she is. What makes you unique? I put God first in all my endeavors, Memorable Quote: “Dare to make a difference”. Message: “I am a female child. I believe parents need to give their daughters the privilege of enjoying their childhood, because if denied it can never be regained. I understand the concern, but I do not feel the girl child should be neglected in male dominated aspects of life”. What makes you unique? I’m a singer. Memorable Quote: “Look for something to do that would solve a problem”. What have you learned from the LEAD Camp experience? “Girls are very important in the community”. This talented young voice was trained by her brother Godwin Onoja. 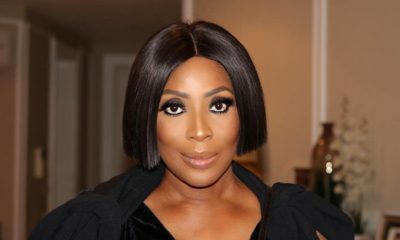 Message: “The potential woman can make a change! A girl is a potential woman and should be given equal rights to study like the boys, if encouraged she will end up becoming a great leader in the future. Girls are potentially good teaches because they have a natural affection for humanity”. What makes you unique? I love music, Memorable Quote: “If you’re going to think, think BIG”. What have you learned from the LEAD Camp experience? “It’s good to be confident”. Message: “Discrimination to an individual or a group of people is to their disadvantage. Over the years and mostly in Africa, the female child has been discriminated against due to religious and cultural beliefs, particularly in the northern part of Nigeria. I would like to plead with the government that they should consider the voice of the female child and eradicate this habitual discrimination. “If we mean to have Heroes, Statesmen and Philosophers, we should have learned women” – Abigail Adams. Name: Enitan Adeniyi, Age: 13, State of Origin: Oyo, Career Choice: Lawyer and Entrepreneur, Favourite Colours: Blue and red, What makes you unique? My fashion sense and style. Memorable Quote: “Dress the way you want to be address, No matter what the problem is be confident and say to yourself i can overcome it.”. What have you learned from the LEAD Camp experience? “I really learned a lot and also want to thank the Junior Achievement Nigeria for giving me the opportunity to be where I am today”. Message: “Power for girls! If someone asked me if power was necessary for girls I would answer “yes of course” because without girls the world is like an empty barrel. I am an only child and I am proud to be a girl, I believe as a girl if I was given more freedom and the privilege to learn more things I will be able to go anywhere. I am frustrated by the voice of others dictating my life because “I am a girl”. As an aspiring lawyer I intend to stop early marriages for the female child and fight for her power to become more than a housewife”. What makes you unique? I like all genres of music. Memorable Quote: “Do something that you would be satisfied with, love and works for you no matter what”. “If you want the bank’s money, make sure you have money” and “Change is constant it never stands at a place”. What have you learned from the LEAD Camp experience? “The LEAD Camp for girls has taught me that no matter how many mistakes you make it would always lead you to the right path”. Message: “The girl is a female in transition, she is the future and she is the powerful spirit that lies behind a woman. She’s a mother, a wife, a sister, an aunt, a daughter. Why then shouldn’t her voice be heard? Why is she turned to live a life of lies and deceit? why is she being forced to be someone who she is not. Girls have been exploited for far too long and now our voices must be heard. A girl is good listener she listens to the voice of others but no one listens to her.A girls power is not measured by her age, her size, her nobility, her environment or the colour of her skin”. Story: One day I woke up and realized that world looked different to me, the world had become mine to conquer. I slipped off my bed and looked out my window, the air was wild and free. It was everything I wanted to be, the life I craved was outside a barbwire fence. My freedom! My life is like a giant cage, I can see the world but the cage is still locked. I’ve pleaded to my jailers but they laughed at my pain but today they finally let me out with a long chain clinging to my foot. For the first time in my lifetime, respect and freedom have finally been given to me. What makes you unique? Comfortable in my own skin, Memorable Quote: “You can’t be comfortable without your own approval”. What have you learned from the LEAD Camp experience? I am all I need to be now and I can be whatever I want to be tomorrow – “Do not let others define who you are”. Message: “Girls need to be heard, we do not need others to define who we are. In most countries, there are a number of policies and certain abominable practices which underestimate and violate the rights of the young female child. In Nigeria, girls are overlooked due to ancient beliefs that the girl child is not needed or should not be allowed to educate herself. Girl duties are shown as that of cooking, cleaning and child bearing, but is that really all there is to a girl’s capability? The answer is no! Although girls are superb at home management and other petty activities, that does not make them any less than men. The saying “what a man can do, a woman can do better” really applies here. Girls who have had access to education one way or another have proven to be more efficient, so help our girls! What have you learned from the LEAD Camp experience? Catch them young, the younger generation of girls have so much more to offer than our current leaders, all they need is motivation, inspiration and consistent support. 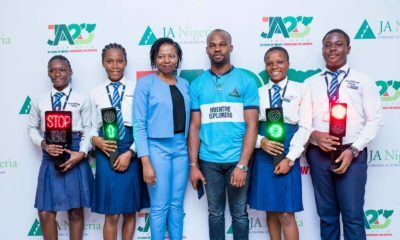 A very big thank you to Junior Achievement Nigeria Team, organizers of LEAD Camp for Girls, sponsors, media partners, panelist, Limeridge Hotel and all the girls I have mentioned, your passion and zeal towards greatness has inspired me and I wish you the best and look forward to hearing more about you in the near future. Every person is special. Love it.